Drum Legend Corky Laing Is Presented The ‘Bonzo Bash Legend Award’ At John Bonham’s Bonzo Bash By Kiss’s Peter Criss! 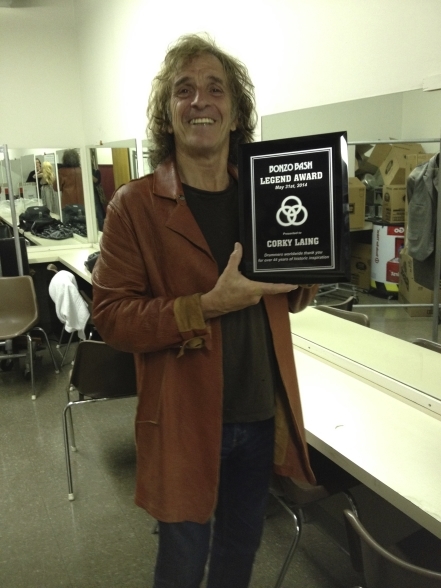 NYC – Much to the excitement of drummers worldwide, one of rock’s icons, drum legend Corky Laing, recently received the prestigous ‘Bonzo Bash Legend Award’ at the Bergen PAC in New Jersey on May 31st. The award was presented by original Kiss drummer Peter Criss! This prolific artist is busier than ever. His latest project, ‘Playing God’, a rock opera created with Matti Häyry and Tuija Takala from Finland, premiered in Basel, Switzerland, and Paris, France in 2013. Recently, in the early spring of 2014, the rock opera was performed in Helsinki, Finland. Laing wrote the music for the album, and is the Musical Director in the stage performances where he also performs a key role, LUKE, who plays drums and sings. The ‘Playing God’ CD was released on GONZO Multimedia on July 15, 2013. Check out Corky’s upcoming appearance! Laing, who wrote the platinum-selling rock anthem, “Mississippi Queen”, chronicles his life from his innocent early days on the Montreal sock-hop circuit (Bartholomew Plus 3 and Energy) to the pinnacle of rock ‘n roll. On June 27, 2014, Laing, whose skills on the skins are matched only by his wit and candour, will relate how he climbed up and fell down with some of the rock world’s most prominent luminaries… but it’s not all talk. Corky will show us exactly how and why he is one of the most acclaimed drummers in the music business. And he took it all in from UNDER THE ROCK! This entry was posted on Monday, June 23rd, 2014 at 00:00	and posted in Corky Laing, Press Release. You can follow any responses to this entry through the RSS 2.0 feed.